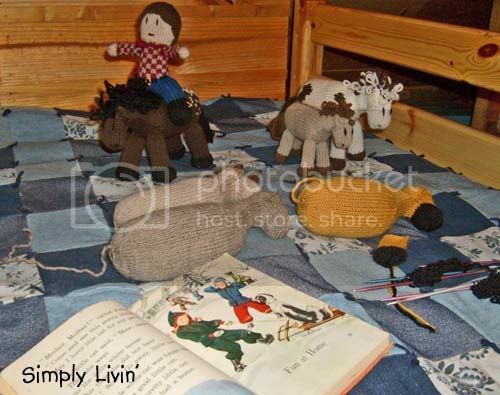 That Family Blog: Wednesday Yarn Along - PONIES!! 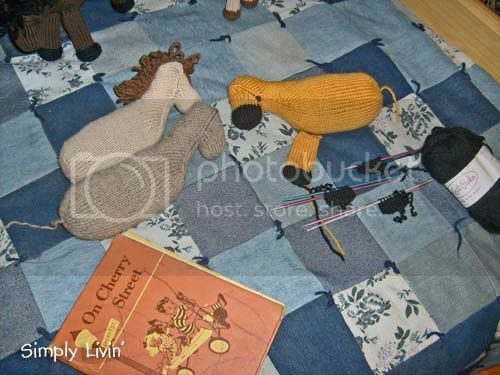 Again, joining with Ginny's Wednesday yarn along to share what I've been knitting and reading lately. Ponies, ponies, ponies! The one I shared in progress in my last week's yarn along was sold before I got the tail on him. So, I went ahead and finished the baby that was going to accompany him and was trying to finish his Momma for the second time when I ran out of yarn. 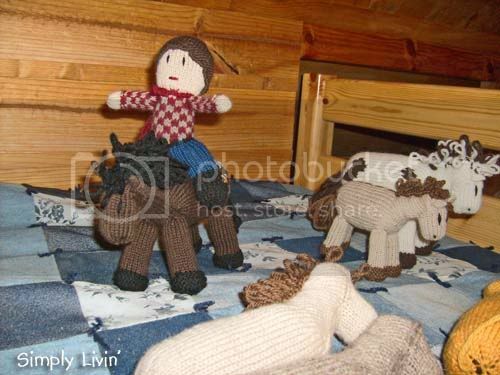 Then I got a second order for my Spirit pony for a return customer and was just two miserable legs away from finishing him when I ran out of yarn. Arrugh! I've let Annie in on my secrets and am having her help me keep up with the demand. She's making another Apple's pony since he's already sold twice to happy customers. 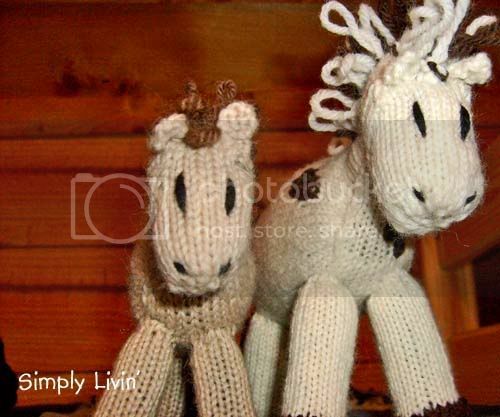 My finished ponies are my company and inspiration as I knit. Their cute little faces tell me that I'm doing a good job! Oh, and no, I am not reading "On Cherry Street". I've already read it myself... When I was 6 or 7. It was the first book I read cover to cover and I was so proud of myself! :) Actually, Johnny is in the process of reading it aloud to me everyday while I knit or work on the computer. Our shop's have been doing very well lately. I am SO happy!! :) And very thankful (tis the season you know!). I've developed a small circle of handmade friends through etsy whom I've come to love and admire, as well as a blooming passion for the natural handmade. Once you've experienced both, there simply is no comparison to the feel of cheap plastic or something real in your hands. I just love the feeling of real, natural material! If you still have some Christmas shopping to do yet, I strongly encourage you to check out little family-run, handmade etsy shops for some lovely gift ideas! Of course I'm partial to the ones on my sidebar. ;) The Vermont Branch Company and the Wood Garden are two of my favorite, just wonderful little family run shops that deserve support for their wholesome genuineness! :) Also, if you're looking for exclusively natural toys you should check out Natural Kids. It's a collaboration of all the natural handmade toy shops on etsy and there are some really great finds on there! Oh those are wonderful! Great ponies! 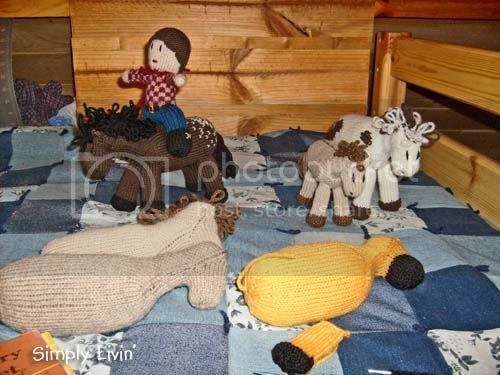 OK....I guess I need to knit some ponies as well. Yours are too cute. I am sure my two year old daughter would love one. Thanks for the inspiration! Hi, just love your ponies and what a wonderful Xmas present for a child to receive(big children too).